For Christmas this past year, my aunt sent me a copy of The Gourmet Cookbook, edited by Ruth Reichl. This 1,008 page cookbook is monstrous and sports over 1,000 recipes. It is big. It is heavy. It is probably the only cookbook you actually need to be able to cook everything. When I first flipped through it, I was overwhelmed. Where to start? And so, I went back to my aunt, because I know she and her husband use this book often. My uncle was kind enough to sit down and write me out a list of his favorite recipes from the book, including page numbers, by hand. It was then mailed to me. I now have that precious piece of paper tucked away in the pages of the massive tome. That is how I found this recipe. I found it on his list, strained as I lifted the gigantic book, and used a fork lift to lift the cover and find the page. What I discovered was a surprisingly simple recipe (which I didn’t follow exactly, but details on that below). I’m often intimidated by cooking fish. I just haven’t had a ton of experience over the years (since I didn’t eat seafood for the first 2/3+ of my life). But this was delicious. The spices were unique and simple, a combination of fennel and lemon. And the warm, garlicy beans with the arugula was just divine. I mean really, there is a lot to love in this recipe. Healthy, delicious, and beautiful. 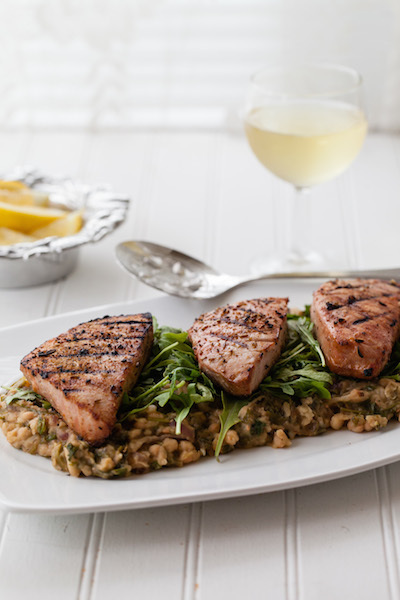 It would be a great dish to throw together for a dinner party. It’s not hard and it would make you look really accomplished and impressive…. And now guests know what they are getting next time they come over. 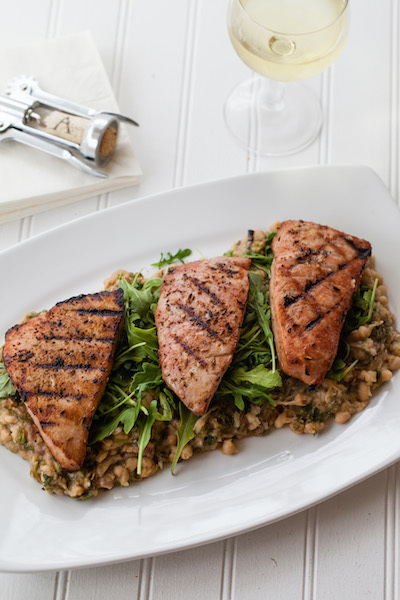 Pop open a bottle of wine, fire up the grill, and enjoy this lovely dish. The original recipe has you cook the beans from dried, but I shortened cooking time here by using canned. If you would like to view the original recipe, you can find it here. Drain and rinse 2 cans of beans. Put them in a medium saucepan with one cup of water and one garlic clove, smashed. Heat over medium heat with salt and pepper for 15 minutes. Prepare the grill for high heat. 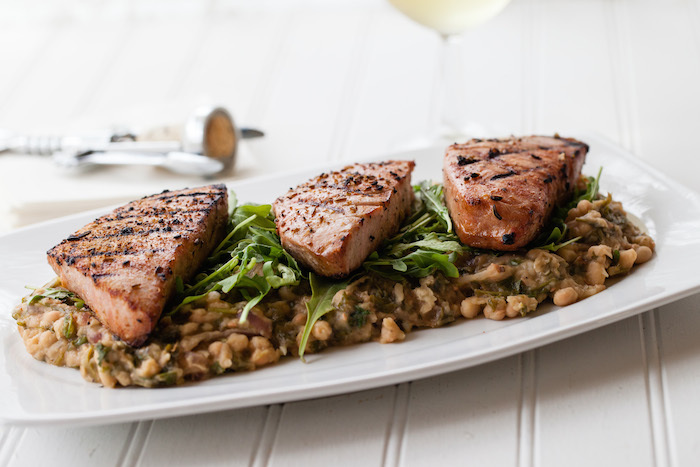 Put tuna steaks on a plate and drizzle with remaining 1 TB each of lemon juice and olive oil, turning to coat both sides. Sprinkle both sides with fennel seeds, salt and pepper. Make the white bean salad. Reserve 1/4 cup cooking liquid from the beans. Then, drain the beans. Add 1 TB olive oil to the pan and sauté the red onions until soft. Take 1/2 cup of the beans into a small bowl and mash them. Add whole beans, smashed beans, reserved liquid, fresh garlic, salt, half of the arugula, parsley, 2 TB lemon juice, 2 TB oil, and salt and pepper to taste. Cover and keep warm over very low heat until tuna is ready. Lightly oil grill and grill fish, uncovered, turning once, until barely cooked through. About 6 minutes. Arrange bean salad on a platter with remaining arugula on top. Top with fish. Serve with lemon wedges for the fish. I happen to be writing to let you understand what a terrific discovery my wife’s girl developed going through your web site. She figured out many issues, not to mention what it is like to have an ideal giving character to have folks completely thoroughly grasp some hard to do matters. You really surpassed visitors’ desires. Many thanks for rendering such productive, trusted, explanatory and in addition unique thoughts on that topic to Jane. I¡¦ve read some good stuff here. Certainly worth bookmarking for revisiting. I wonder how much attempt you place to make this kind of wonderful informative website.